This post is part of a virtual book tour organized by Goddess Fish Promotions. Alice Jane-Marie Massa will be awarding a $20.00 Panera Gift Card (US only) to a randomly drawn winner via rafflecopter during the tour. Click on the tour banner to see the other stops on the tour. About the Author: Although Alice Jane-Marie Massa has lived in Milwaukee, Wisconsin, for over 25 years, growing up in the rural Indiana town of Blanford (with a population of approximately 400) influenced the subject matter and style of her writing. After earning master's degrees from Indiana State University and Western Michigan University, Alice, still a Hoosier at heart, taught for 25 years, including 14 years of teaching writing and public speaking at Milwaukee Area Technical College. Having retired from teaching English and grading stacks of student papers, she now focuses on her own writing. Holiday Greetings! Marianne and Judy--Special thanks to Goddess Fish for making possible the 15-day Blurb Blitz Tour for my book, THE CHRISTMAS CARRIAGE AND OTHER WRITINGS OF THE HOLIDAY SEASON. I greatly appreciate my holiday book's being noticed by so many more people and displayed in such an attractive banner on the fifteen hosting blog sites. Now, we just have to wait to find out who are the winners of the two Panera gift cards. I will look forward to mailing the gift cards to the winners soon. Season's Greetings! 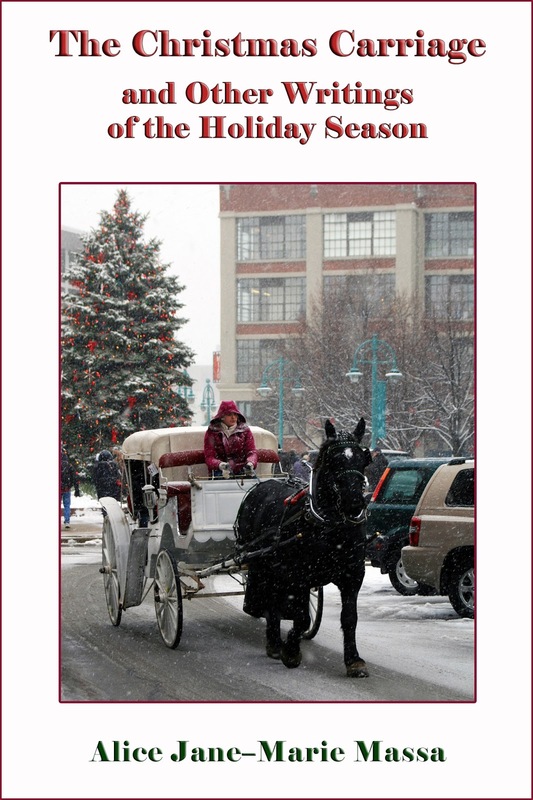 Judy Thomas--Thank you for hosting the fifteenth and final day of the Blurb Blitz Tour of my book, THE CHRISTMAS CARRIAGE AND OTHER WRITINGS OF THE HOLIDAY SEASON. I hope your readers will enjoy the excerpts of my holiday book. Thanks, Rita. This Blurb Blitz Tour has been quite an experience for me, and I appreciate your taking the time to follow my blog tour.